"I come to like myself more..." How about make this to a new habit? 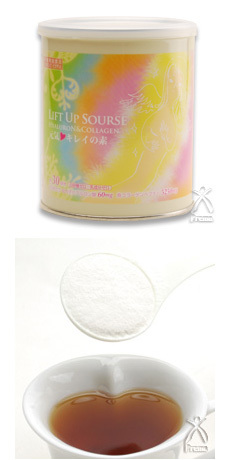 Cosmetic ingredients: Coix extract, elastin, vitamin C and biotin, blended with dietary fiber inulin, roast salt and "QiPower Salt" which has high restorative power. It is an ideal dietary supplement for the modern women who wish to live every day of their lives with grace. It is an extravagantly-achieved condensation of the nutrients which are considered to be the "source of health and beauty". White-sugar free and dairy-constituent free. No preservatives nor coloring nor scents added. This supplement enables you to ingest 60mg of low molecular weight hyaluronic acid and 5250mg of fish collagen peptide per day. Nutrition-promoting food supplement (vitamin C and biotin). Vitamin C is a nutrient that supports the maintenance of the health of skin and mucous membrane, as well as being an antioxidant. The percentage of its Nutrient Reference Value officially shown for one day: 125%. Biotin is a nutrient that supports the maintenance of the health of skin and mucous membrane. The percentage of its Nutrient Reference Value offcially shown for one day: 100%. Produced with natural materials, there may be some difference in the taste, the color and the fragrance according to the lot. However, rest assured that such difference does not affect the quality, so enjoy it with peace of mind. Fish collagen, inulin (dietary fiber), Coix extract, elastin peptide, solar salt, trehalose, vitamin C, hyaluronic acid and biotin. Please enjoy it as a nutrition-promoting food supplemet by dissolving 7g per day, (roughly about one full spoonful of the spoon enclosed), in your favorite beverages. Please store in a cool place, away from heat, humidity and direct sunlight. After opening, make sure to replace the lid tightly and use the contents without delay.